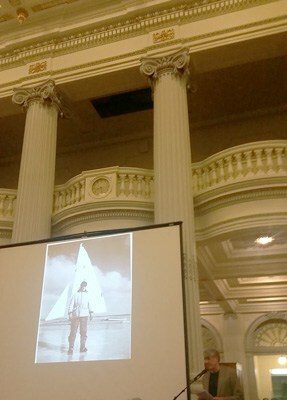 OT Havey, the man who commissioned MARY B, on screen at the awards ceremony. 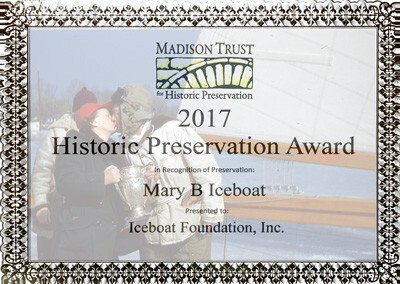 In the grand setting of the reading room of the Wisconsin State Historical Society, the MARY B group was awarded for their efforts to return, restore, and maintain Madison’s most winning stern steerer. 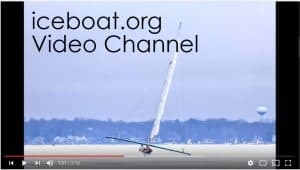 Special guest at the event was Marianne Hobbins, who was there to honor the iceboat that her father, OT Havey, dreamed about, commissioned Frank Teztlaff to build, and named after her mother, Mary Bernice Havey. Don Sanford accepted the award on behalf of the group with Bill Bauer, Peter Fauerbach, Jerry Simon, and Steve Holztman there as well. Kudos to the Madison Trust for Historical Preservation for having the vision to recognize that a community’s stories are at the heart of historic preservation. This special award along with Bill Mattison’s upcoming induction into the Madison Sports Hall of Fame, reminds Madisonians that ice sailing has always been an important part of what makes this area a special place.